To continue the ongoing list of Korean food recommendations that are indeed not Korean BBQ or bibimbap, here are a few more coming from a very Americanized Korean’s perspective. What that means is that these five dishes won’t test your limits of what is palatable so the leap of faith is indeed a short one here. Think of it as a beginner’s guide. Regardless, the list still contains staples of Korean cuisine and could very likely yield your next favorite dish. So if you’ve fallen madly in love with Korean BBQ, but things just aren’t the way they used to be, take a stroll down galbi jjim lane. Same cut of beef here, but the preparation is entirely different. The meat is cooked slowly in a marinate with dates, carrots, onions, ginkgo seeds, chestnuts, mushrooms, you name it, thrown in a bit later in the process. All those flavors get infused in both the broth and the meat. By the time it’s ready to eat, the meat is falling off the bone and straight into your mouth. You’ll never look at galbi the same way again. 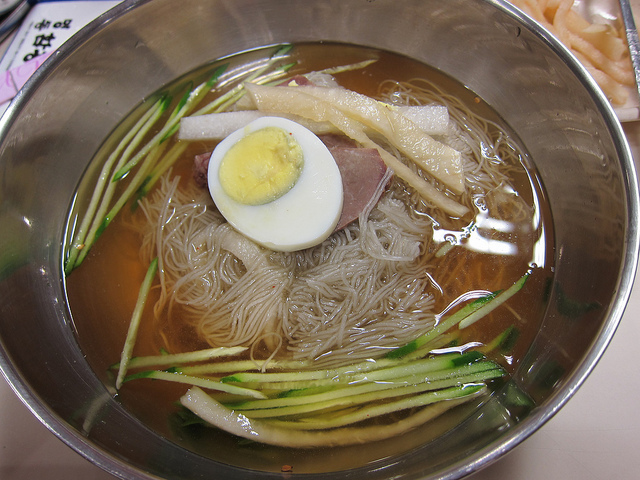 Naengmyeon comes primarily in two forms, so let’s tackle them separately. Korea’s most effective edible remedy to hot summers is mul naengmyeon (물 냉면), or Pyongyang nangmyeon, as that’s where the dish originated from. It consists of buckwheat noodles in a mixture of ice-cold pear juice and beef broth, topped off with julienned pickled radish and cucumbers. The dish is topped off with a halved hard boiled egg and thinly sliced beef. Spicy mustard and vinegar can be added to give the dish some bite for those chasing a bit of acidity and sinus pains. The second iteration is called bibim naengmyeon (비빔 냉면), or Hamhung naengmyeon. Bibim naengmyeon is more along the lines of what non-Koreans would expect out of a Korean dish. 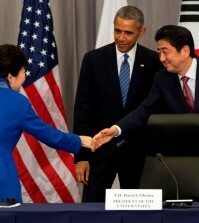 In fact it’s not so different from bibimbap. The flavor in bibim naengmyeon is a lot richer because at its base is gochujang(고추장) or a spicy chili paste. Throw in some kimchi, chopped greens, vinegar, sesame seeds and that’s pretty much it. 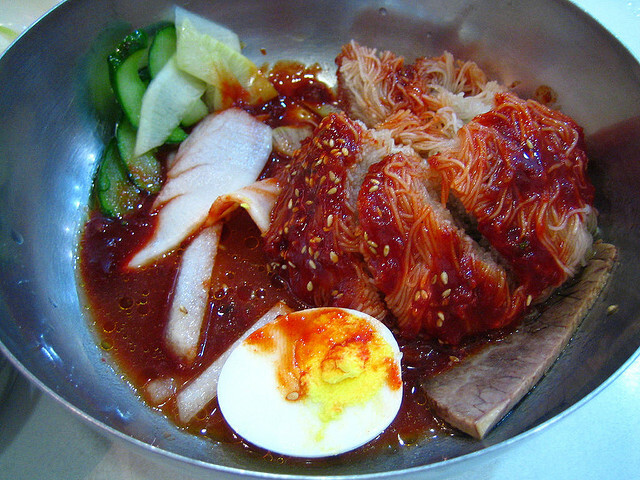 The main distinction between bibim naengmyeon and mul naengmyeon is the type of noodles that are used. For bibim naengmyeon you’ll find that the noodles are even chewier because they’re made from potatoes rather than buckwheat. Just like its counterpart, it is served cold. This one also originates from North Korea, but to be more specific it comes from the city of Hamhung, which is located at the very north end of North Korea. Korea’s version of chicken soup for the soul. Except in this case, substitute the chicken with oxtail. 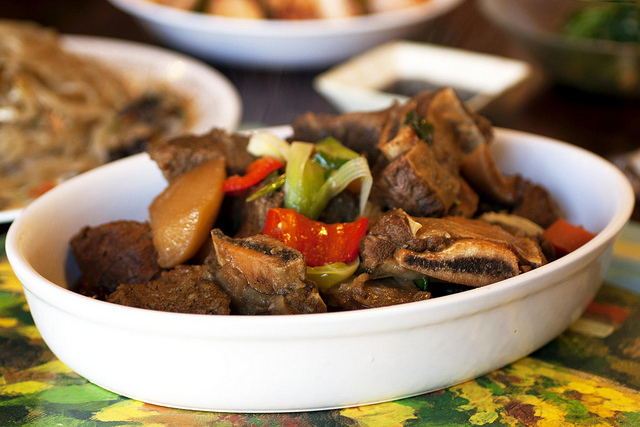 Oxtail is one of those things where if you didn’t know it was oxtail, you would happily eat it to your stomach’s content. 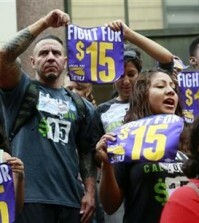 But as soon as you start visualizing where it comes from and how exotic it sounds, you might just skip lunch that day. Kkori-gomtang is a simple dish that is easy on the palate despite one unorthod-ox ingredient (see what we did there?). The broth is usually milky white and the bones can get a bit slippery so don’t be afraid to use your hands. Due to the mild flavor of 꼬리곰탕, it’s always a safe bet to indulge in some of the banchan (반찬) or side dishes that pack a bit of a kick. Honestly, this soup does wonders for the common cold and that’s a proven scientific fact (don’t look it up). A tasty stew that also carries a lot of tradition. 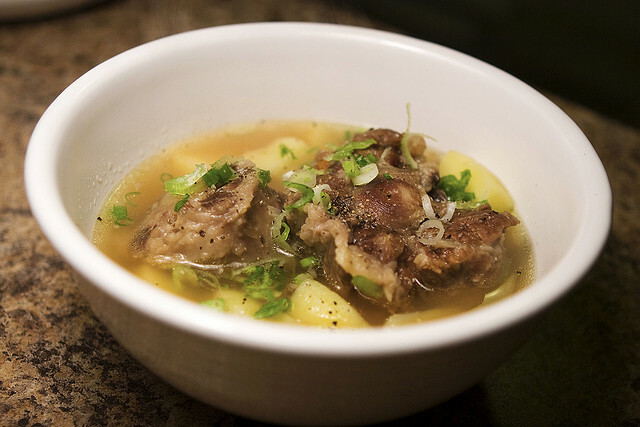 It starts with a meat broth (beef, chicken, pork, seafood, the possibilities are endless!) and includes thinly sliced rice cakes topped off with julienned eggs, 김 (dried seaweed) and green onions. 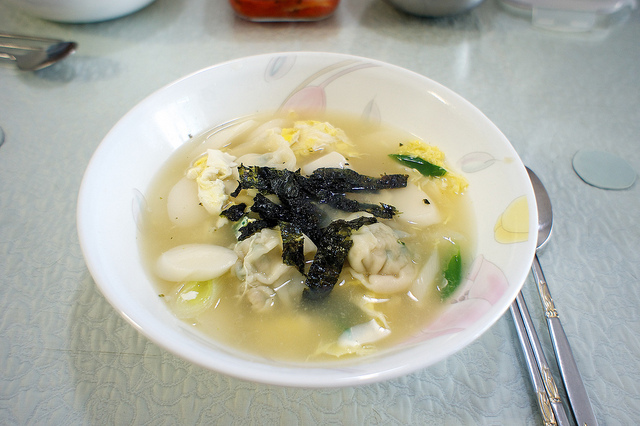 Koreans believe that eating this particular dish on New Year’s Day brings both good luck and adds a year to your age. To be more specific it’s supposed to be eaten on Seollal (설날) or Korean New Years, which adheres to the lunar calendar, but these days it goes both ways. It’s not as if this dish only pops up one day out of the year. It’s still a very popular dish. If for whatever reason you can’t find a place that serves it, go make your own. There are plenty of recipes out there and it’s not too difficult to whip up.